A self-professed White Garment church founder has been arrested over possession of human skull, horn and other fetish items. 55-year-old Alimi Isaiah, the founder of C&S Idapomimo Zion in Alagbado area of Lagos was nabbed on the 4th of May 2017 by Policemen doing a stop and search along the Lagos Ibadan expressway. The suspect who dressed in a white garment at the time of his arrest told police he was on his way to another branch of his church when he was arrested. 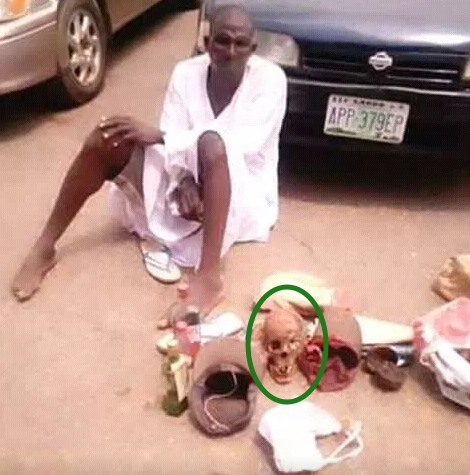 He allegedly confessed that he was heading to Imini, via Ijaiye with the aim of using the charms and human skull to ward off armed robbers who have been terrorizing residents of the area. Other items recovered from his Nissan Primera car with registration # LAGOS APP 379 EP include assorted clothes, criminal charms, buffalo horn, human skull, 160 rounds of ammunition and gunpowder. Oyo State Police Commissioner Abiodun Odude said the Pastor will be charged to court after investigation.